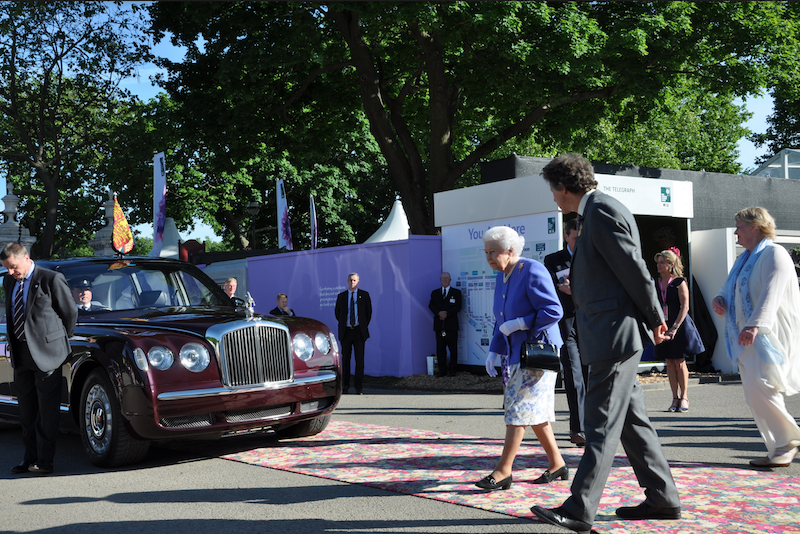 Alternative Flooring delivered a red carpet with a difference at the RHS Chelsea Flower Show in London back on 22nd May 2017 for the Queen and other Royal guests. With florals being very much the focus of the day, it was fitting that the fabulous Flowers of Thorpe, a famous Liberty floral pattern expertly woven into carpet for the first time by Alternative Flooring was used to greet the Royal entourage at the biggest horticultural event on the calendar. The choice of floral carpet all came about after the team at the RHS Chelsea Flower Show spotted Alternative Flooring’s award-winning carpet in House & Garden magazine and asked if they could work together to produce the grand Gala entrance. Experts in flooring runners as well as stunning design, Alternative Flooring set about making a 19 linear metre piece of carpet which was then expertly cut into two, to create a stunning 38 linear metre runner. Bright, bold, patterned floorcoverings are making a huge comeback in interior design and florals are no exception. 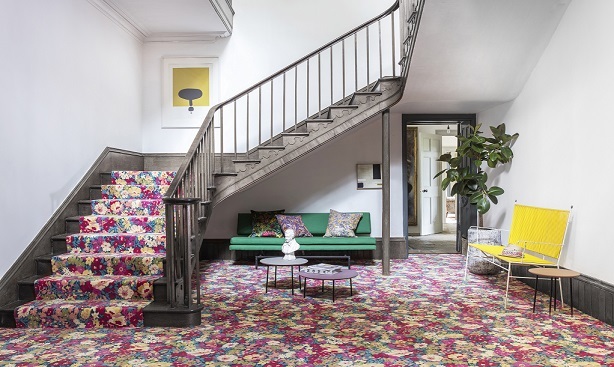 In a recent article, the Daily Mail talked about fabulous floral patterned carpets and how they are very much back in fashion and more flamboyant than ever! Liberty Fabrics have been creating original and inspiring designs for more than 130 years and the Flowers of Thorpe pattern which features in the Alternative Flooring collection, is a classic Liberty floral that was created in the 1970’s but emulates the wonderful small flower designs that were popular at Liberty back in the 1930’s. The style which is synonymous with the Liberty brand, has been revived as a carpet, made in Britain and woven on Axminster looms in Wilton, Salisbury by Alternative Flooring. Alternative Flooring and Liberty Fabrics teamed up in 2016 to create 4 designs in a contemporary range of colours, including the use of designs originally created by artist William Morris. 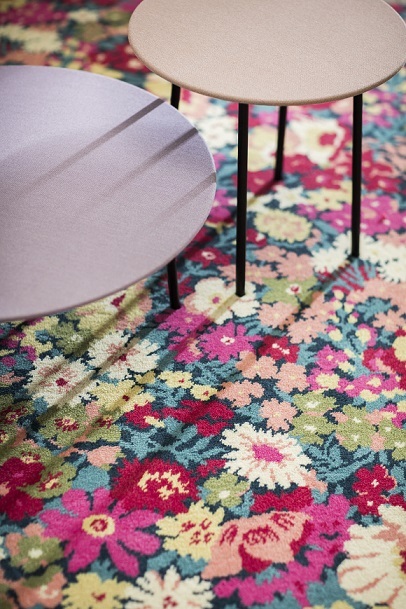 Forming part of Alternative Flooring’s Quirky B range, the styles produced with Liberty Fabrics are the perfect blend of old and new and for the first time in history, feature some of Liberty Fabrics’ most iconic patterns on carpet. What’s great about the Flowers of Thorpe carpet from Alternative Flooring is that it can set the decorative style of a room. With eight colours to choose from within the carpet pattern, green, red, cream, yellow, coral, pink, teal and blue, there are plenty of options for complementing colour schemes across walls and furnishings. It can be spread right across the floor of a room as carpet or used as a runner or bespoke rug with space to breathe, bringing a colour scheme to life. Whether you’re going for full on contemporary or looking to emulate a vintage look and feel, floral patterned flooring is a must to consider. You can see samples of Alternative Flooring’s Quirky B range and the Liberty Fabrics collection, including the Flowers of Thorpe pattern that was used to greet the Queen at the RHS Chelsea Flower Show, at our Knutsford Design Centre and Bowdon showroom. If you are interested in floral carpet or a floral runner for your home, we can provide you with a free survey and quotation; or for a bespoke floral rug, call into either our Knutsford or Bowdon showrooms for more information.